Fly Ties - Fly Fishing Line Sunglass Retainer/Strap - Light Weight, Waterproof, Multiply Color and Size Options (Large, Black) by Fly Ties Fishing Apparel at Sunglasses Tokyo. MPN: 43235-24835. Hurry! Limited time offer. Offer valid only while supplies last. Fly Ties offers you professionally designed sunglass retainers that meet our own exacting demands - those of the avid fishermen and outdoorsman. Fly Ties offers you professionally designed sunglass retainers that meet our own exacting demands - those of the avid fishermen and outdoorsman. 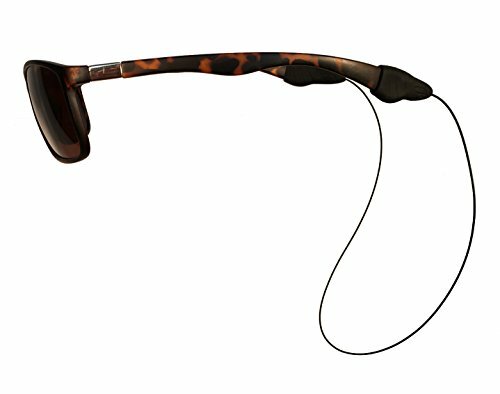 Using high-grade fly fishing line, coupled with a custom detachable end piece, we created a lightweight, exceptionally strong, and flexible sunglass retainer/sunglass strap for the sportsman who demands both style and performance. End pieces offered in various sizes. The Small will fits most sunglasses on the market, while the Large is designed for larger sunglasses such as the Wayfarer. If you have any questions about this product by Fly Ties Fishing Apparel, contact us by completing and submitting the form below. If you are looking for a specif part number, please include it with your message.